The designs of Iranian Rugs are copied by weavers from other countries as well. Iran is also the world's largest producer and exporter of handmade Rugs, producing three quarters of the world's total output. Though in recent times, this ancient tradition has come under stiff competition from machine made products. Iran is also the maker of the largest handmade Rug in history, measuring 60,546 square feet. Persian Rugs can be divided into three groups; Farsh / Ghali' (sized anything greater than 6x4 feet), Ghalicheh (meaning Rug, sized 6x4 feet and smaller), and nomadic carpets known as Gelim (گلیم) Kilim, (including Zilu, meaning rough carpet). The art of Rugs weaving existed in Iran in ancient times, according to evidence such as the 2500- year-old Pazyryk Rug, dating back to 500 B.C., during the Achaemenid period. The first documented evidence on the existence of Persian Rugs came from Chinese texts dating back to the Sassanid period (224 - 641 AD). This art underwent many changes in various eras of the Iranian history to an extent that it passed an upward trend before the Islamic era until the Mongol invasion of Iran. After the invasion, the art began to grow again during the Timurid and Ilkhanid dynasties. With the passage of time, the materials used in Rugs, including wool, silk and cotton will decay. Therefore archaeologists are rarely able to make any particularly useful discoveries during archaeological excavations. What has remained from early times as evidence of Rugs -weaving is nothing more than a few pieces of worn-out Rugs. Such fragments do not help very much in recognizing the Rugs - weaving characteristics of pre-Seljuk period (13th and 14th centuries AD) in Persia. 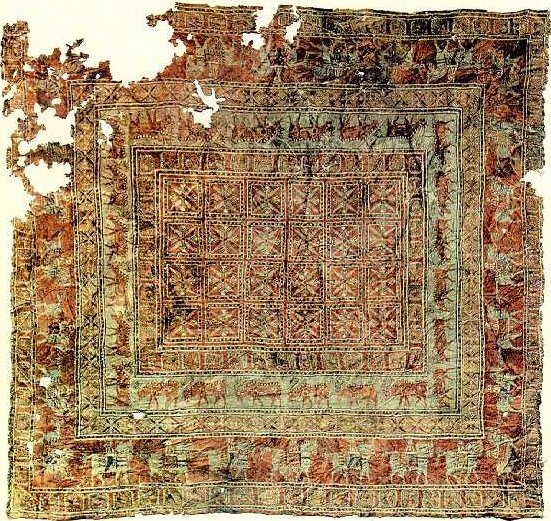 The Pazyryk Rug, the oldest known surviving Rug in the world, 5th century BC. In a unique archaeological excavation in 1949, the exceptional Pazyryk Rug was discovered among the ices of Pazyryk Valley, in Altai Mountains in Siberia. The Rug was found in the grave of a Scythian prince. Radiocarbon testing indicated that the Pazyryk Rug was woven in the 5th century BC. This Rug is 283 by 200 cm (approximately 9.3 by 6.5 ft) and has 36 symmetrical knots per cm2 (232 per inch2). The advanced weaving technique used in the Pazyryk Rug indicates a long history of evolution and experience in this art. Pazyryk Rug is considered as the oldest carpet in the World. Its central field is a deep red color and it has two wide borders, one depicting deer and the other Persian horseman. However, it is believed that the Rug from Pazyryk is not likely a nomadic product, but a product of the Achaemenid period. Historical records show that the Achaemenian court of Cyrus the Great at Pasargade was decked with magnificent Rugs. This was over 2,500 years ago, while Persia was still in a weak alliance with Alexander the Great, who would later betray her. Alexander II of Macedonia is said to have been dazzled by the Rugs in the tomb area of Cyrus the Great at Pasargade. By the sixth century, Persian Rugs of wool or silk were renowned in court circles throughout the region. The Bahārestān (spring) Rug of Khosrow I was made for the main audience hall of the Sassanian imperial Palace at Ctesiphon in Sassanian province of Khvārvarān (nowadays Iraq). It was 450 feet (140 m) long and 90 feet (27 m) wide and depicted a formal garden. In 7th century CE With occupation of the Sassanian capital, Tuspawn, the Baharestan Rug was taken by the Arabs, cut into small fragments and divided among the victorious soldiers as booty. According to historians, the famous Taghdis throne was covered with 30 special Rugs representing 30 days of a month and four other Rugs representing the four seasons of a year. Wool is the most common material for Rugs but cotton is frequently used for the foundation of city and workshop Rugs. There is a wide variety in types of wool used for weaving. Those of which include Kork wool, Manchester wool, and in some cases even Camel Hair wool. Silk Rugs date back to at least the sixteenth century in Sabzevar and the Seventeenth century in Kashan and Yazd. Silk Rugs are less common than wool Rugs since silk is more expensive and less durable; they tend to increase in value with age. Due to their rarity, value and lack of durability, silk Rugs are often displayed on the wall like tapestries rather than being used as floor coverings. Persian Rugs are made up of a layout and a design which in general included one or a number of motifs. The Iran Rugs Company, a specialist in the subject, has attempted to classify Persian Rugs designs and has carried out studies of thousands of Rugs. Their results show that there have been slight alterations and improvements to almost all original designs. In its classification the company has called the original designs as the 'main pattern' and the derivatives as the 'sub patterns'. 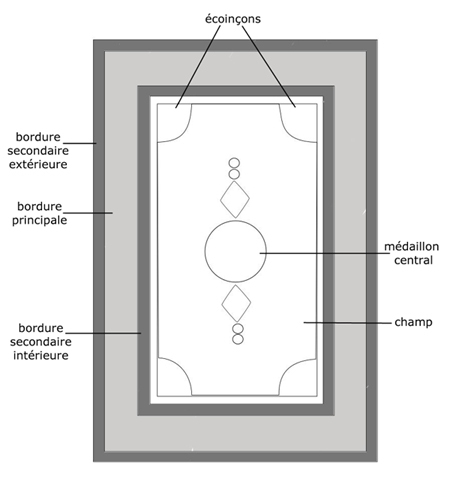 Design can be described in terms of the manner in which it organizes the field of the Rug. One basic design may serve the entire field, or the surface may be covered by a pattern of repeating figures. In areas using long-established local designs, the weaver often works from memory, with the patterns passed on within the family. This is usually sufficient for simple rectilinear design. For the more elaborate curvilinear designs, the patterns are carefully drawn to scale in the proper colors on graph paper. Each square thus becomes a knot, which allows for an accurate rendition of even the most complex design. Designs have changed little through centuries of weaving. Today computers are used in the production of scale drawings for the weavers. To begin making a rug, one needs a foundation consisting of warps strong, thick threads of cotton, wool or silk which run the length of the rug and wefts similar threads which pass under and over the warps from one side to the other. The warps on either side of the rug are normally combined into one or more cables of varying thickness that are overcast to form the selvedge. Weaving normally begins by passing a number of wefts through the bottom warp to form a base to start from. Loosely piled knots of dyed wool or silk are then tied around consecutive sets of adjacent warps to create the intricate patterns in the rug. As more rows are tied to the foundation, these knots become the pile of the rug. 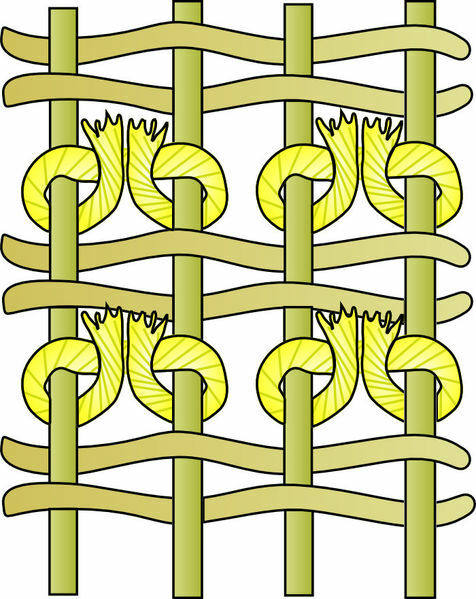 Between each row of knots, one or more shots of weft are passed to tightly pack down and secure the rows. Depending on the fineness of the weave, the quality of the materials and the expertise of the weavers, the knot count of a handmade rug can vary anywhere from 16 to 550 knots per square inch. Vertical looms are undoubtedly more comfortable to operate. These are found more in city weavers and sedentary peoples because they are hard to dismantle and transport. There is no limit to the length of the Rug that can be woven on a vertical loom and there is no restriction to its width. The Tabriz loom, named after the city of Tabriz, is used in North Western Iran. The warps are continuous and pass around behind the loom. Tension is obtained with wedges. The weavers sit on a fixed seat and when a portion of the Rug has been completed, the tension is released and the Rug is pulled down and rolled around the back of the loom. This process continues until the Rug is completed, when the warps are severed and the Rug is taken off the loom. 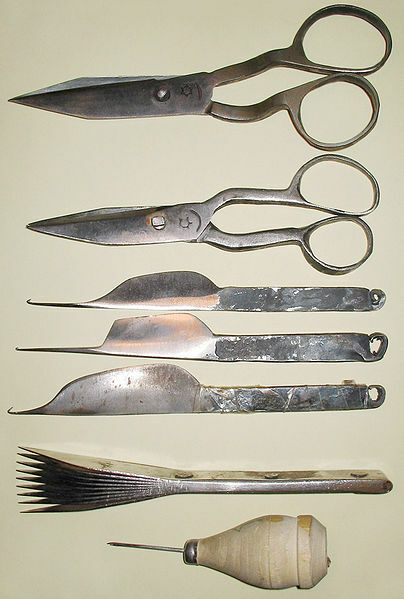 A variety of instruments are used for packing the weft. 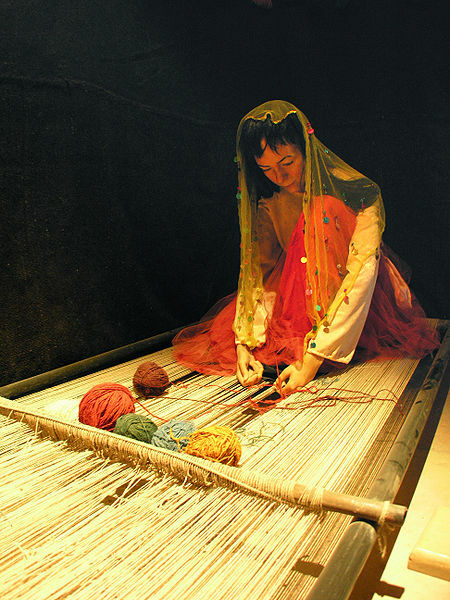 Some weaving areas in Iran known for producing very fine pieces use additional tools. In Kerman, a saber like instrument is used horizontally inside the shed, and in Bid jar a heavy nail like tool is used. Bid jar is also famous for their wet loom technique, which consists of wetting the warp, weft, and yarn with water throughout the weaving process to make the elements thinner and finer. This allows for tighter weaving. When the Rug is complete and dried, the wool and cotton expand to make the Rug incredibly dense and strong. A number of different tools may be used to shear the wool depending on how the Rug is trimmed as the Rug progresses or when it is complete. Often in Chinese Rugs the yarn is trimmed after completion and the trimming is slanted where the color changes, giving an embossed three- dimensional effect. Two basic knots are used in most Persian Rugs and Oriental Rugs: the symmetrical Turkish or Ghiordes knot (used in Turkey, the Caucasus, East Turkmenistan, and some Turkish and Kurdish areas of Iran), and the asymmetrical Persian or Seneh knot (Iran, India, Turkey, Pakistan, China, and Egypt). Flat woven Rugs are given their color and pattern from the weft which is tightly intertwined with the warp. Rather than an actual pile, the foundation of these Rugs gives them their design. 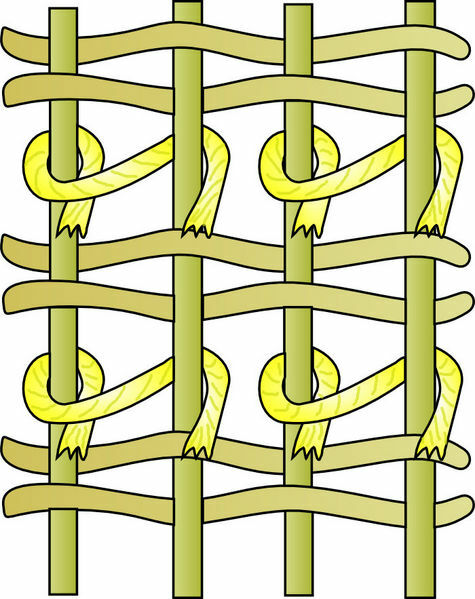 The weft is woven between the warp until a new color is needed, it is then looped back and knotted before a new color is implemented. The most popular of flat-weaves is called the Kilim. Kilim Rugs (along with jewelry, clothing and animals) are important for the identity and wealth of nomadic tribes-people. In their traditional setting Kilims are used as floor and wall coverings, horse-saddles, storage bags, bedding and cushion covers. The major classical centers of Rug production in Persia were in Tabriz (1500–1550), Kashan (1525–1650), Herat (1525–1650), and Kerman (1600–1650). The majority of Rugs from Tabriz have a central medallion and quartered corner medallions superimposed over a field of scrolling vine ornament, sometimes punctuated with mounted hunters, single animals, or animal combat scenes. Perhaps the best-known of the Tabriz works are the twin Ardabil carpets most likely made for the shrine at Ardabil (today in the collections of the Victoria and Albert Museum in London and the Los Angeles County Museum). Kashan is known for its silk Rug production, most famously, for the three silk hunting Rug masterpieces depicting mounted hunters and animal prey (currently in the collections of the Vienna Museum of Applied Arts (aka the MAK), the Museum of Fine Arts, Boston, and the Stockholm Museum). 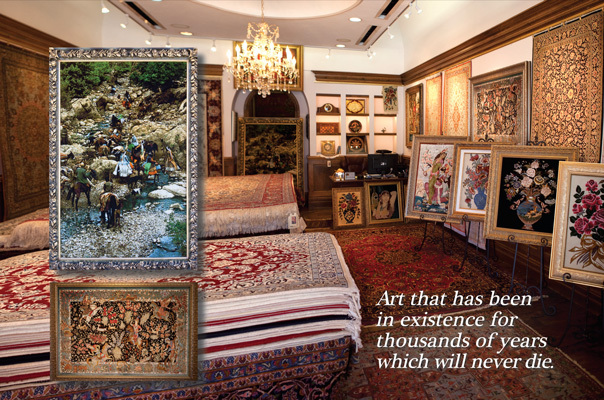 The Kashan Rugs are among the most valuable in existence. The seven classes of Kerman Rug were defined by May Beattie. She identified their unique structure and named it the "vase technique." Rug types in this group include garden Rugs (ornamented with formal gardens and water channels) and the ogival lattice Rugs. A fine and well-known example of the latter was purchased by the Victoria and Albert Museum under the guidance of William Morris. The influence of Persian Rugs is readily apparent in his Rug designs. The Seraband Rug is produced in Arak. The Persian Rug (Persian Farsh فرش, meaning "to spread" and Ghali) is an essential part of Persian art and culture. Rug-weaving is undoubtedly one of the most distinguished manifestations of Persian culture and art, and dates back to ancient Persia. In 2008, Iran’s exports of hand-woven Rugs were $420 million or 30% of the world's market. There is an estimated population of 1.2 million weavers in Iran producing Rugs for domestic markets and international export. Iran exports Rugs to more than 100 countries, as hand-woven Rugs are one of its main non-oil export items. The country produces about five million square meters of Rugs annually -- 80 percent of which are sold in international markets. In recent times Iranian Rugs have come under fierce competition from other countries producing reproductions of the original Iranian designs as well as cheaper substitutes.